Street Fighter is one of the most popular video games ever made and helped jump start arcades and the one-on-one fighting game genre. And now you can play a card game with characters and themes from the famous franchise. 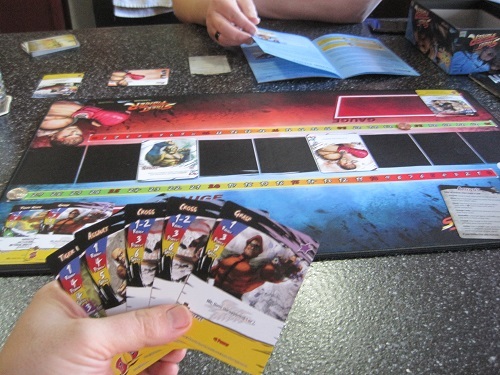 Exceed is an existing card game with fighter style mechanics, and their latest series includes characters from Capcom’s classic series. You can read more about it here, but before you do, please make sure to read my review below. Here is a larger picture of the box of cards that I reviewed. 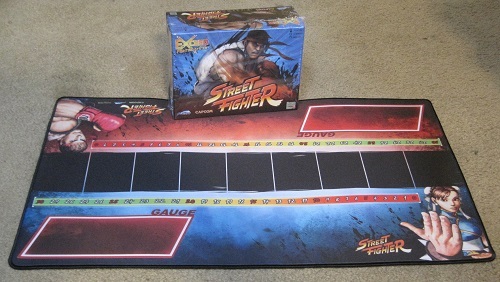 The game is for two players and each box comes with four character decks for you to try. Each box has four characters decks for you to try. Each one has special attacks and moves for that character. For instance, Sagat has cards representing his Tiger Uppercut and whatnot. The set also comes with little boxes for you to hold each deck in, but you have to put them together. 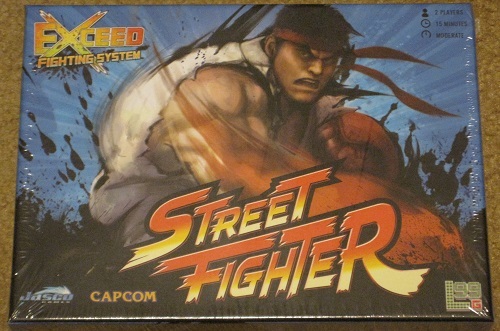 I’m a little bummed that the box I got to review has the most boring-est characters ever: Ryu, Sagat, Zangief, and Akuma. It’s too bad I didn’t get the M. Bison box as it has my favorite character Cammy in it. And the Chun-Li box has Chun-Li and Dan, two of my other favorite characters. Oh well, beggars can’t be choosers. The game is a bit more complicated than I can explain, but I will do my best to summarize it. Each player takes turns and can do one action on their turn. They can draw a card, move their character card on the board, among other things. You’ll want to make sure your character card is in enough range to hit the enemy if you attack, kind of like how you have to move left and right on the 2-D Street Fighter stages. Attacking is how you win the game, as whoever runs out of hit points first, loses. You can also lose if you reshuffle your deck once and run out of cards, but the way the game is played, I imagine this would rarely ever happen. Especially if you play aggressively like my friend and I did when we played. When you choose an attack from your hand, it’ll have numbers on it. The range number tells you how close you have to be to your opponent for the attack to work. The power number tells you how many hit points to take from your opponent. But you’ll have to subtract points if they block with a certain number. And the speed number tells who attacks first. Certain attacks also have special effects like knocking back your opponent a few spaces, or stunning them, preventing their attack. So you have to watch out or your attack will be negated completely. When you take a hit, or cause a hit of your own, you can put your used cards into the gauge meter. You can then use these cards as currency to do even more powerful moves or upgrade your character. And that’s really the game in a nutshell. Here’s a picture of a game in progress. I liked how this game uses themes from the fighter series in its rules. Like moving on a 2-D plane and making sure you have enough range for attacks, using special moves and your gauge meter. What I didn’t like was how complicated the rules were. After a few plays, it becomes easier to understand, as it only takes 20 to 30 minutes to play. But I don’t really play complicated card games very much. Anything more complicated than Hungry Hungry Hippos and my eyes glaze over. That’s what happened when my friend was explaining the rules to me. So I’d say this game is best for older kids. It would be neat to see other fighter franchises get the Exceed treatment, though. Like Soul Calibur or SNK’s fighters. Oh man, wouldn’t a real version of SNK vs. Capcom: Card Fighters Clash be neat? Level 99 makes some great games. They’re known for designing games that have very asymmetrical gameplay between players but yet are well balanced. The main designer has a competitive videogame fighter background, and it shows in his balance and choice of gaming themes.